A family of agile marketing products that will help you stay focused, deliver projects on time, and make your team happy. Content marketing software to drive strategy and growth. 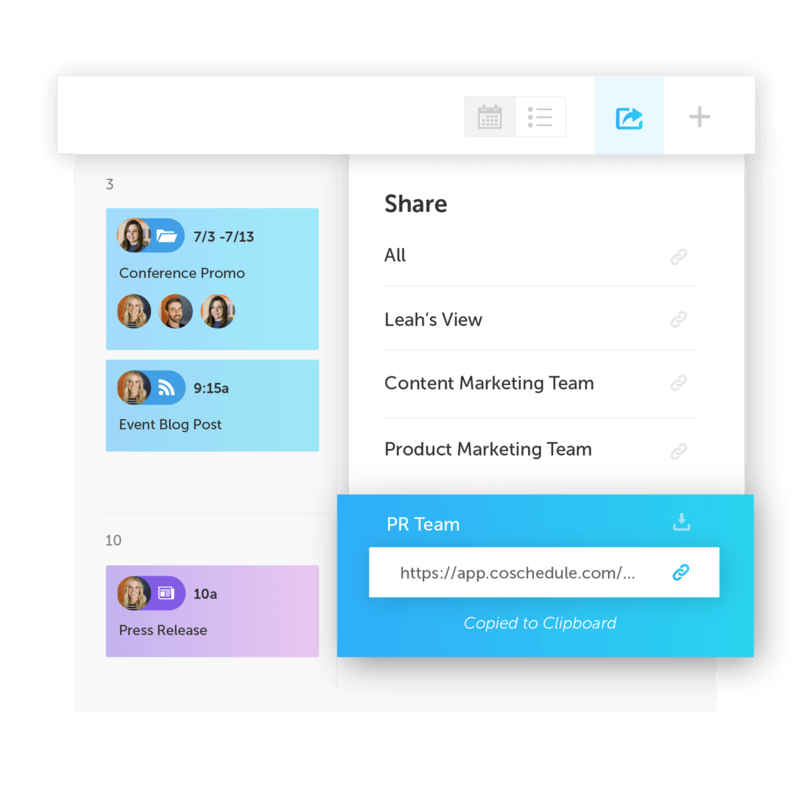 Team collaboration software to manage and automate workflows. Social media management software from publishing to measurement. Digital asset management software to organize and share everything. Cross-functional calendar for global visibility of every project. See how CoSchedule customers have found success. Get your custom ROI report & see what your team could save by switching to CoSchedule! Get the latest updates on the company, product, and team. Content to help marketers plan, organize, and meet their goals. Weekly interviews, strategy, and advice for the marketing pro. Find out how to short-circuit the path to jaw-dropping growth. How to implement an agile marketing strategy. How to choose, prioritize, plan, and execute projects. The strongest predictors of success with goals, strategy, & more. Work management processes that drive the best results. Write headlines that drive traffic, shares, and search results. Create powerful social messages that convert. Write email subject lines that drive more conversions. Create and manage a single publishing calendar that serves as the blueprint for your content, social, email, events, and more - all in one place. Group multiple, related projects together in a single campaign. 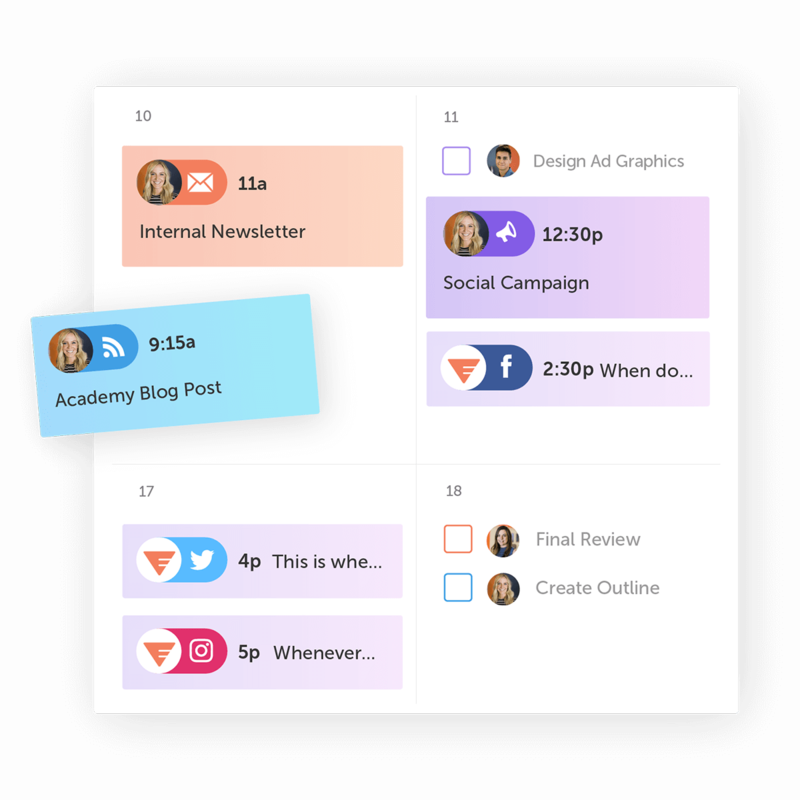 Outline promotional timelines and project plans on an isolated calendar view so you can stay focused on specific initiatives. 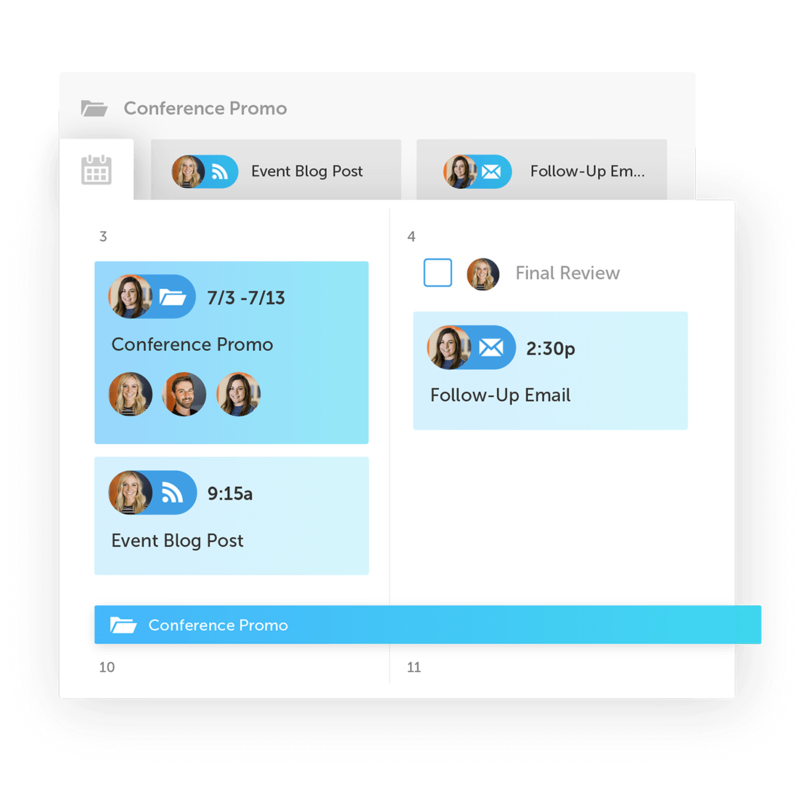 With CoSchedule’s drag and drop functionality, making quick changes to entire promotional campaigns is easier than ever! Simply drag and drag your content to a new day and anything associated with it will automatically sync to its new time. Tailor your settings to easily categorize, prioritize, and emphasize what's on your calendar. Filter your calendar to focus on the work that you care about. Create custom sub-calendar views for emails, blog posts, internal departments, or team members - just to name a few. And get a laser-focused view of specific marketing initiatives or campaigns. "I should know anything and everything that has to do with my department at all times, and CoSchedule has given me the ability to do that." 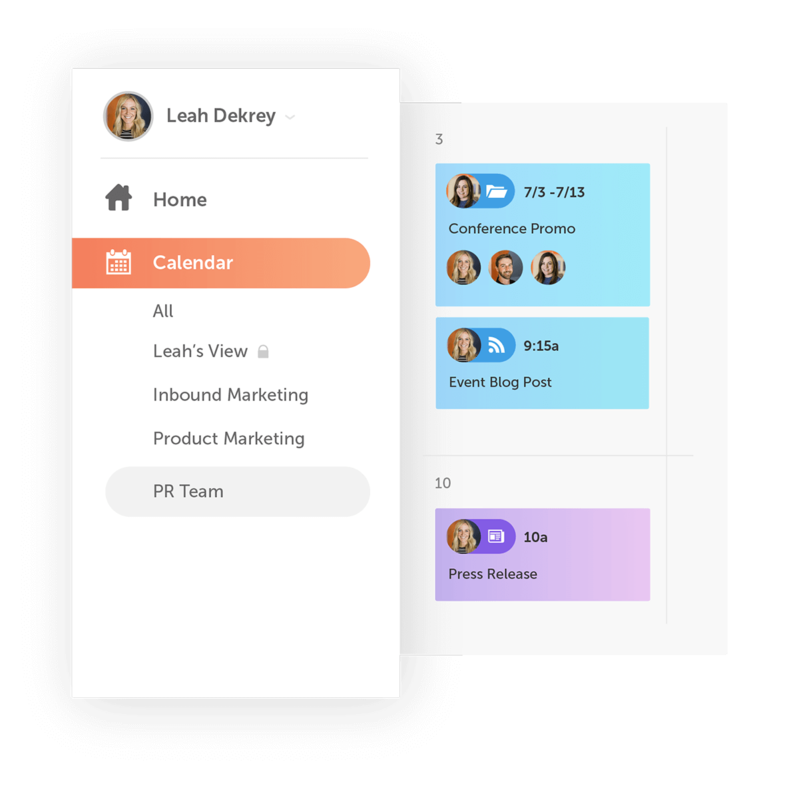 Keep higher-ups "in the know"
With Read-Only Views, you can create custom, filtered views of your calendar that are interactive, update in real-time, and give your leadership and/or clients the details they want (nothing more, nothing less). Plan, promote, and execute your entire marketing strategy in one place. © Copyright 2019, all rights reserved. See our Terms & Policies.